The Nautical Mile, as a unit of measurement, was first defined as an international standard in Monaco in 1929 at the First International Extraordinary Hydrographic Conference. Prior to that, there was no international standard for measuring distances either while traveling in water or, or more importantly, over water. In the world of aviation, the standard way to measure distance is the nautical mile. However, the word standard opens the door for deviation from the norm. One exception is using the statute mile (SM) as opposed to the nautical mile (NM) with regards to the VFR visibility requirements, which all pilots know refer to the basic VFR weather minimum (14 CFR 91.155), which is specific to different types of airspace and altitudes. And, unless you are just getting started, you are familiar with the term VFR which stands for Visual Flight Rules. The VFR weather minimum boils down to the rationale for needing greater visibility (and more distance from clouds) when flying above 10,000MSL (or, "mean sea level," which measures aviation altitude) because pilots need more time to see (and avoid) aircraft that may pop in and out of clouds. Another exception to the rule that the nautical mile is the iron-clad universal measure and is the measurement regarding cloud clearance, that also employs statute miles (SM) rather than nautical miles (NM). A precise cloud clearance requirement is necessary because it's hard to know if that scene out of the hangar door measures up with true meteorological conditions, or, if the scene out of a pilot's windscreen measures up, for that matter. 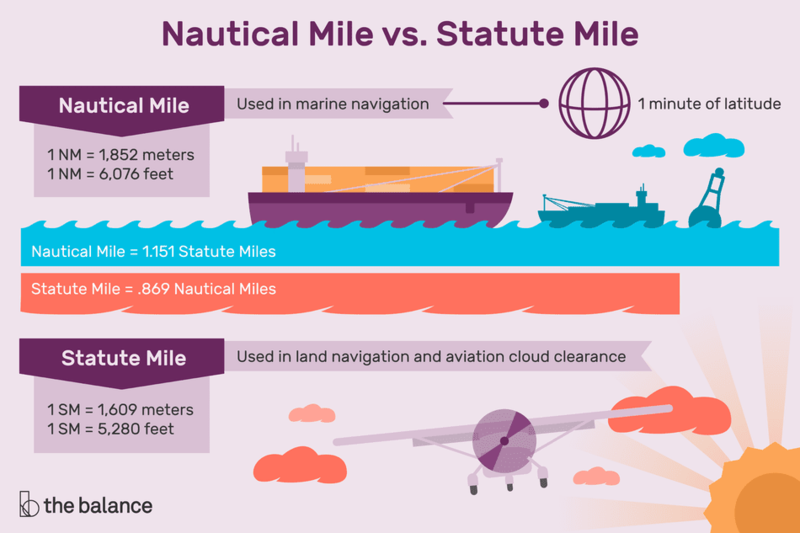 Nevertheless, here are the definitions of both nautical miles and statute miles, along with a few easy conversions. In the world of aviation, distance is generally measured in nautical miles, with the exception of visibility, which is usually stated or forecasted in statute miles. When exploring nautical miles, it's worth noting the difference with often-used terms such MPH and knots. MPH: In statute miles, speed measurements are given in miles per hour, the same as in vehicles. Knot: The standard speed measurement in aviation is the knot. One knot is equal to one nautical mile per hour. Airspeed indicators on aircraft are calibrated in knots.